Home No flour, sugar or Diet Coke – Is this Paleo? It’s Day 39 of my Body Fat Reduction Challenge. I’m down 13 pounds from when I started, but haven’t lost a bit of weight in nearly two weeks. I’m not eating a ton of food, I work out 5-6 days a week and don’t eat much that I don’t prepare myself. But that’s not enough. For the month of March, I’m giving up flour, sugar and Diet Coke in an attempt to lose more of my gut, increase my energy and get buff enough to survive the 2012 Ironman in Tempe. I’m on day 3 of my challenge and holy crap, it’s way harder than I thought. Flour is in nearly everything. Sugar, or its many -cose forms, is in everything. Diet Coke is horribly addictive and makes my brain go nuts without it. None of these things are essential for a proper, healthy diet, but in my search for food to eat both in and outside of my house, it’s tough to find anything with flour or sugar. And the cravings…oh the cravings. My energy has plummeted and I’ve never craved a cookie so bad in my entire life than I have for the past three days. March 1 and 2 were tough as I increased my caffeine intake to somehow compensate and I’m fully expecting to be hurting for another day or two. But this morning, while boxing with Vin, I felt like I was winning. I felt better. I had a taste of tiger blood. Low/no processed food/sugar lifestyles work. They work well. They’re just really hard to maintain because we are used to eating a lot of really crappy food. 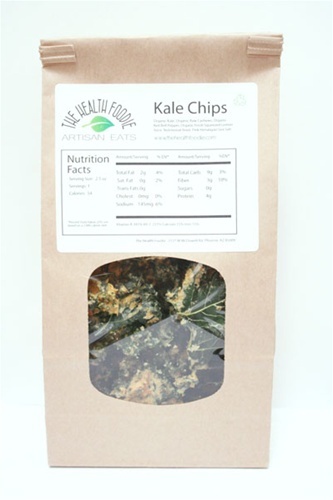 My snack today was Kale Chips. Yep, dried lettuce. I hope I make it.